Oh don’t read too much into the title. Its just an over-thought way of saying that Grand Rounds is up and running over at the Health Business Blog and one of my posts have been included! And some special thanks to the author David Williams for sending special love for my blog name! Thanks David. 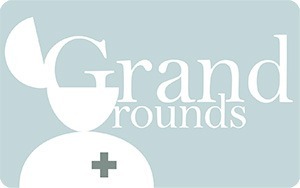 Tags: Grand Rounds, PostADay2011. Bookmark the permalink. Previous post ← Trick or Treatment: Do Doctors Encourage Poor Patient Behaviors?